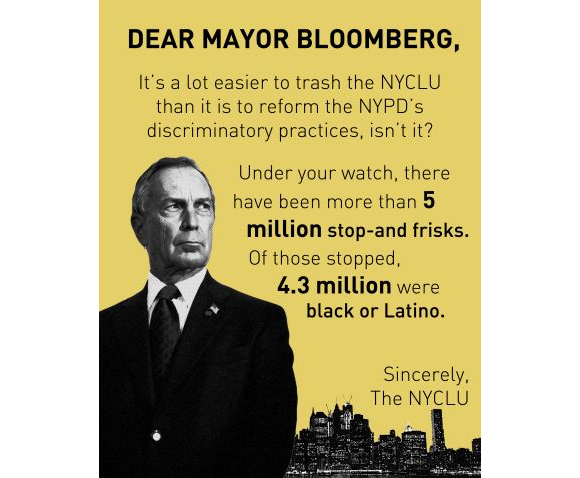 Yesterday NYC Mayor Michael Bloomberg equated the two in defending his police department use of Stop and Frisk. I loathe that illegal guns threaten our communities every day, especially black and Latino communities, because politicians don�t have the courage to stand up for the measures that can save lives. In Washington, some elected officials don�t have the courage to stand up to the special interests on the right and pass common sense gun laws. And in New York City, some don�t have the courage to stand up to special interests on the left and support common sense policing tactics like stop and frisk. We don�t need extremists on the left or the right running our police department, whether it�s the NRA or the NYCLU. Part of the stop-and-frisk program is executed under Operation Clean Halls, a program wherein private property owners grant officers prior permission to enter a property for enforcement against criminal activity. Some NYPD officers have objected publicly to the department's use of stop-and-frisk paperwork as a performance metric, which they claim encourages officers to overuse the practice and creates public hostility. Activists have described this as a form of quota, a characterization that department representatives have denied . The City offers police patrols in residential buildings to prevent drug use and sales. Landlords can request that the police conduct patrols in the hallways and stairwells of their building to remove non-residents who are loitering. To request a police patrol, contact the Community Policing Office at your local police precinct. NEW YORK -- Jay Victorino was standing outside his mother's apartment when he was grabbed by police, and he says if she hadn't come downstairs to identify him he would've been arrested on a trespassing charge. That's because his mother's South Bronx building is one of thousands of private dwellings patrolled by the New York Police Department under a program known as Operation Clean Halls. Victorino, 28, has mixed feelings about the program � on one hand, he has seen his neighborhood become safer. On the other, he doesn't think it's right to be targeted. The NYPD�s stop-and-frisk practices raise serious concerns over racial profiling, illegal stops and privacy rights. The Department�s own reports on its stop-and-frisk activity confirm what many people in communities of color across the city have long known: The police are stopping hundreds of thousands of law abiding New Yorkers every year, and the vast majority are black and Latino. An analysis by the NYCLU revealed that innocent New Yorkers have been subjected to police stops and street interrogations more than 4 million times since 2002, and that black and Latino communities continue to be the overwhelming target of these tactics. Nearly nine out of 10 stopped-and-frisked New Yorkers have been completely innocent, according to the NYPD�s own reports. Jacqueline Yates is one of a dozen New Yorkers who filed a class action lawsuit against the city. The plaintiffs claim the tactics used in the NYPD's "Operation Clean Halls" program which grants police officers access to thousands of private apartment buildings are unconstitutional. "The NYPD is using 'Operation Clean Halls' as an excuse to stop, question, frisk, detain and even arrest innocent people, including residents of the buildings," said Alexis Karteron, NYCLU. Tenants told story after story of visiting friends and relatives arrested for trespassing; of sons and daughters harassed during a simple trip to the corner store; of missed days at work to fight false charges in court. "My sister doesn't come to visit any more just because she is afraid of being harassed and being arrested just for coming to visit," said Fawn Bracy, a plaintiff. Meanwhile, the NRA is busy protesting things like this. It is illegal for a person under the age of 21 to buy beer. Yet, a lawsuit filed by the National Rifle Association wants them to be able to buy a deadly machine that exists for the sole purpose of forcing a high-velocity slug of metal into another human being. Yesterday, one of the most conservative federal appeals courts in the country disagreed. I'm going to assume they'll support this idea as well. It would make sense, considering the extensive youth program they have. Tell me again how the NYCLU is as extremist as the NRA? Billionaire Mayor Bloomberg gives a lot of people the warm and fuzzies about gun control -- I'll even include myself among them, but as The Atlantic points out, this is a double edged sword. As a politician, he is authoritarian. He's pushed to ban trans fat, smoking and - yes, we can laugh about it - super sized drinks in the city. The mayor might be a vocal advocate for gun control -- he's got the money for it but be aware: This is a man that also advocates racial profiling. Of course, Bloomberg has been going both ways on religious tolerance and civil liberties for a while now � also tolerating Police Commissioner Ray Kelly�s draconian surveillance and harassment of local Muslims. So I shouldn�t have been shocked when Bloomberg lost it Tuesday over mounting criticism of Kelly�s �stop and frisk� policies, which disproportionately target young African-American men. Shamefully, he equated the NYCLU with the NRA � it�s not the first time he�s done that � and even got in a little race-baiting against the New York Times. Nice. Mayor Stop and Frisk is the real friend of African-Americans, unlike those white elitists at the New York Times. Be wary of wolves in sheeps clothing. He's the 7th-richest person in the United States. He was Democrat before he ran for office and switched parties in 2001 to run for Mayor. In 2005, he became an independent. This is rarely mentioned these days: "He campaigned to change the city's term limits law in the wake of the 2008 financial crisis and was elected to his third term in 2009 as an independent candidate on the Republican ballot line."